Sunshine Necklace . Live in the sunshine, swim the sea, drink the wild air.” -Ralph Waldo Emerson As the sun travels across the sky, its journey reminds us of our own passage through life. Inspired by Emerson’s quote, Erin Pelicano made this simple yet stunning tribute to our star as an austere celebration of a life lived basking in its glow. Possessing a delicate yet industrial appeal, hand-hammered silver, brass, and copper “suns” suggest brilliant rays as the thin stack dangles from a polished sterling silver chain. Handmade in Maryland. Honeycomb Necklace . This elegant miniature honeycomb pendant offers a touch of sophisticated sweetness, whether worn with a favorite blouse or a casual top. A perfect cross-pollination of natural geometries and contemporary design, it’s crafted from a stacked cluster of tiny sterling silver tubes, with a single tube receiving a honey-like filling of 18k gold. A matte finish gives the pendant an extra visual warmth. Artist Erin McCloskey creates each one by hand using 100% recycled metals, which lets you enjoy all the luster of the precious materials with minimal impact on the environment. Wearable Planter Necklace . Poet John Keats wrote, “A thing of beauty is a joy forever.” Designer Colleen Jordan wanted to know if that is true, and began to create jewelry that combines the fleeting with the permanent to create something truly timeless. 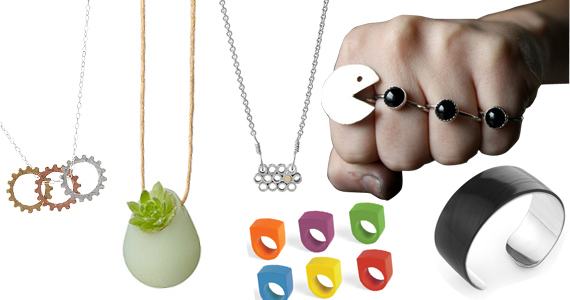 These extraordinary pendants, created using the latest 3D printing technology, are designed to hold some of nature’s fragile creations–wildflowers, succulents, air plants, or other tiny greens. The 3D process is able to produce delicate, seemingly impossible forms, using a durable plastic resin in colors that complement their organic component. Add a few spoonfuls of soil to create a tiny living garden, or use the vessels as miniature bud vases. Record Cuff Bracelet . A little bit Earth-friendly, a little bit rock n’ roll, this unique cuff bracelet is all style. Made by designer Jeff Davis, the record cuff is the result of smart design combined with his commitment to give new life to cast-off albums. Rescued from landfills, yesterday’s top 40 hits are recycled into this sleek vinyl and rhodium-plated brass bracelet. An unusual gift for music aficionados and vinyl collectors, the cuff lets your favorite rocker know you think she’s solid gold. 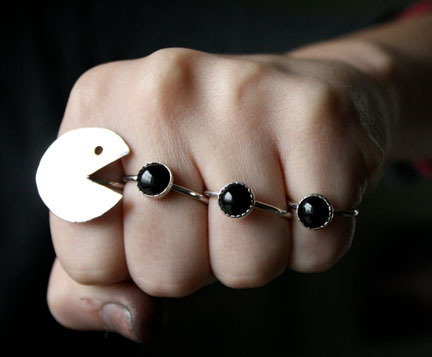 Pac Man Ring Set. The first main ring features a sterling silver Pac Man. The following three rings are sterling silver as well with black onyx cabs on top. 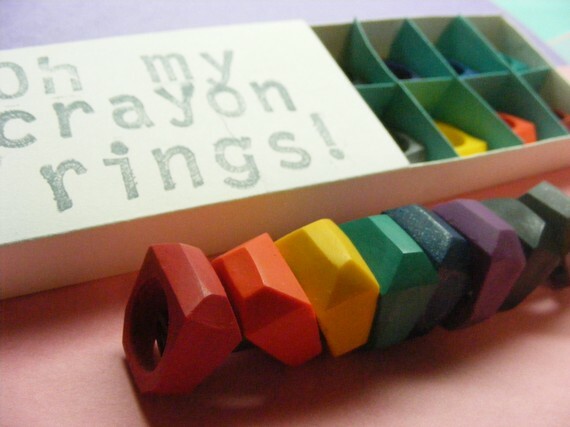 Crayon Ring Set of 8. An exclusive new style of crayon ring, which incorporates a stainless steel ring core for sturdier, EVERYDAY wear. The stainless steel insert is for a longer lasting crayon ring.